Winter in Minnesota. Back the car out of my driveway, reach the road and my car immediately slides, sideways downhill. I think I need new tires. We all know it is important to maintain our systems, but rarely do we make it a priority. For instance, how much of an impact would maintaining the virtual delivery agent (VDA) have on the performance of my virtual app or desktop session? Would it affect the server? Because the latest versions of the VDA includes new buffers, reducers, transducers, flex capacitors and the holo-inducers (just kidding on some of the technobabble, but there are improvements continuously made to improve the overall experience that directly affects the scalability of the host servers). Look at the following graph showing CPU utilization for different LoginVSI tests. Each category uses the same test parameters (policies and workloads). The only thing changing was the VDA. So remember… Maintain, because set and forget doesn’t work. Daniel would a Win 7 machine show a similar pattern with lower CPU usage? 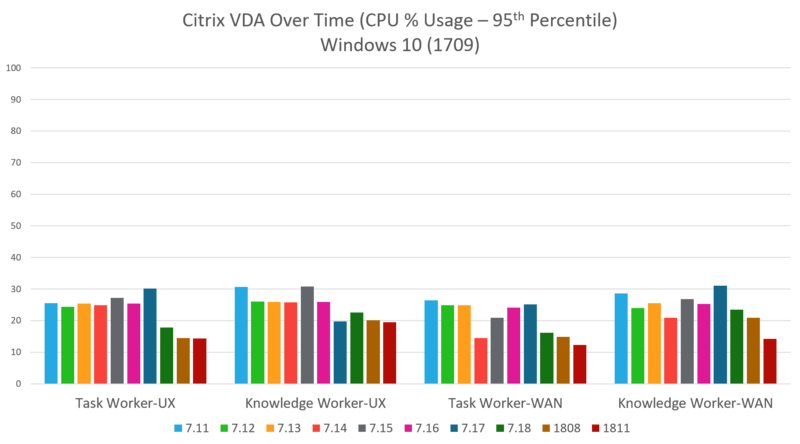 We are on 7.15 CU3, Win10/2016 for Dekstops/Apps, should we look to upgrade the VDA’s to the latest or stick to like with likes on the version you are on (7.15 CU3)?